In the sleepy town of Riverton, legend tells of a serial killer who swore he would return to murder the seven children born the night he died. Now, 16 years later, people are disappearing again. Has the psychopath been reincarnated as one of the seven teens, or did he survive the night he was left for dead? Only one of the kids knows the answer. Adam “Bug” Heller (Max Thieriot) was supposed to die on the bloody night his father went insane. Unaware of his dad’s terrifying crimes, he has been plagued by nightmares since he was a baby. But if Bug hopes to save his friends from the monster that’s returned, he must face an evil that won’t rest…until it finishes the job it began the day he was born. 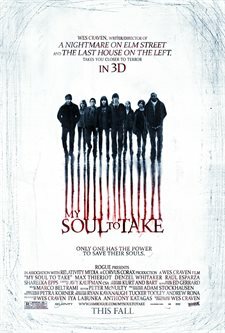 Download My Soul to Take in Digital HD from the iTunes store. My Soul to Take images are © Rogue Pictures. All Rights Reserved. 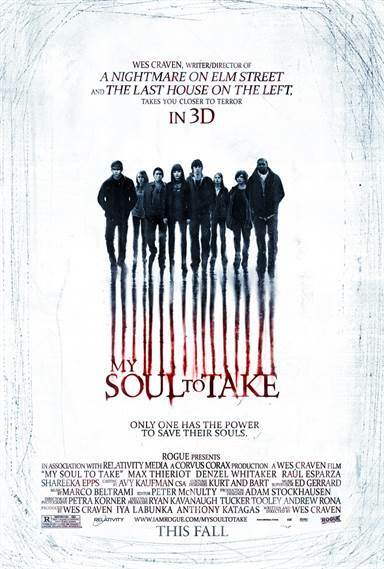 After having a five-year hiatus from directing the Master of Horror, Wes Craven is back this fall with his latest film, My Soul To Take. My Soul To Take takes place in the sleepy town of Riverton, where a legend tells of a serial killer, The Ripper, who swore he would return from the grave. Now, 16 years later, children born the night of the Ripper's death are starting to die. Wes Craven is a legend amongst most movie goers -- he has even taught in college film classes, and has created such legendary movies as Nightmare on Elm Street, The Hills Have Eyes, Shocker, and Scream. However, on this outing, it appears Wes should have waited a bit longer for his return to the silver screen. The story, written by Wes Craven, is such an incoherent mess that it is just laughable. Unless you like to see murder and mayhem (like any other slasher film), do not bother with this one on Blu-ray. The main character, Bug (Jumper, Nancy Drew) is down right unlikeable and has acting skills that are non-existent. The supporting cast is also extremely one-dimensional,and by the time you start to get to know them, they are killed off from the film. It appears that Wes was going through the motions creating this film while working Scream 4, which is scheduled to come out next Spring. The soundtrack, by Marco Beltrami, is strictly by the numbers and does not add any elements to the story. Personally, they should have gone against the grain of just musical scores and gone with a heavy metal soundtrack -- just like they used in the trailer, You're Going Down by Sick Puppies. I personally long for the good old days of an amazing Wes Craven, but if this is any indication of how Scream 4 might turn out then I think his days of being one of my favorite directors is over.